Introduction to Nigel’s 2012 Big Japan Bike Ride. Crazy Kiwi on a Mama-chari! 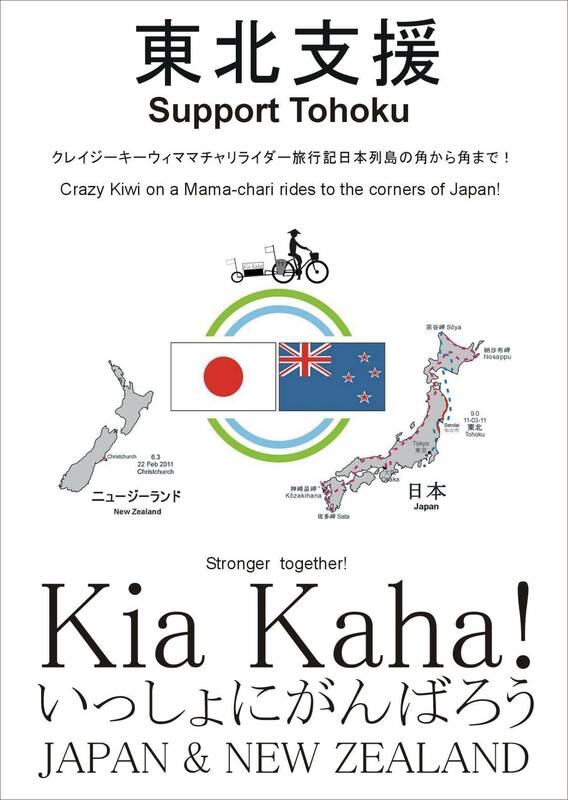 On 12th May 2012 I depart Christchurch for my second big Japan Bike Ride. The first one was last year. Visit http://www.crazyguyonabike.com/doc/bigjapanbikeride to see a journal of journey. There are several differences this year. This year I hope to do more to support the tsunami survivors. When help was not forthcoming last year I did it just for fun. The cycling part is easy, just start and keep going from A to B. Last year I started packing 2 hours before leaving New Zealand and was unsure I would actually do the ride until the day of departure from Tokyo to the start at Sata Misaki. This year I have been preparing for the journey for several months already and there is still 3 weeks to go before leaving New Zealand. Setting up and organising fund-raising and other related activities is much more complicated than expected. Much more! Last year it was just me. This year as part of the support for tsunami survivors I would like others to join me along the way, either for a few minutes, a few hours, a few days or even a few weeks. Going to the four points of the compass of the four main islands is the primary goal. There will probably be more goals to add at a later date; for instance what about 5 shines or 6 temples or 7 cycling roads? Perhaps a reader can help? See below map of provisional route and start dates. These may change subject to events. After discovering there were many small interesting stories within the one big one, I would also like to make a documentary of the journey. It might be interesting to have several hundred people cycling together at the end! Ahhhh, one can dream!! A Sony Cybershot HX7v or Handycam HDR-PJ760V were used to take all photos on this blog. 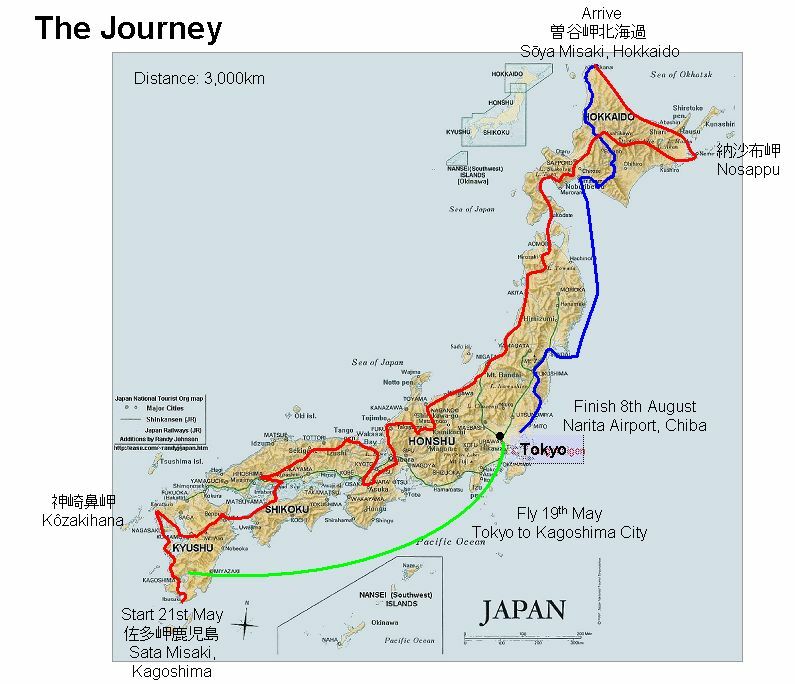 This entry was posted in Cycle Touring, Hokkaido, Honshu, introduction, Japan, Kansai, Kyushu, Osaka, Shikoku, Tohoku and tagged cycle touring, introduction, Japan. Bookmark the permalink. 1 Response to Introduction to Nigel’s 2012 Big Japan Bike Ride. Hello, Nigel. I’m Kay Katzhiko Takashige, who is an ADVENTURE RUNNER, used to be a international cyclist and JACC(Japan Adventure Cyclist Club) member. You might know Daisuke Nakanishi. Last year I ran across the US. Next year I will run across Australia and New Zealand. This year I ran across Japan from Hokkaido to Kyushu. This is also my 2nd crossing Japan. Hope we’ll see you somewhere along the way. P.S. 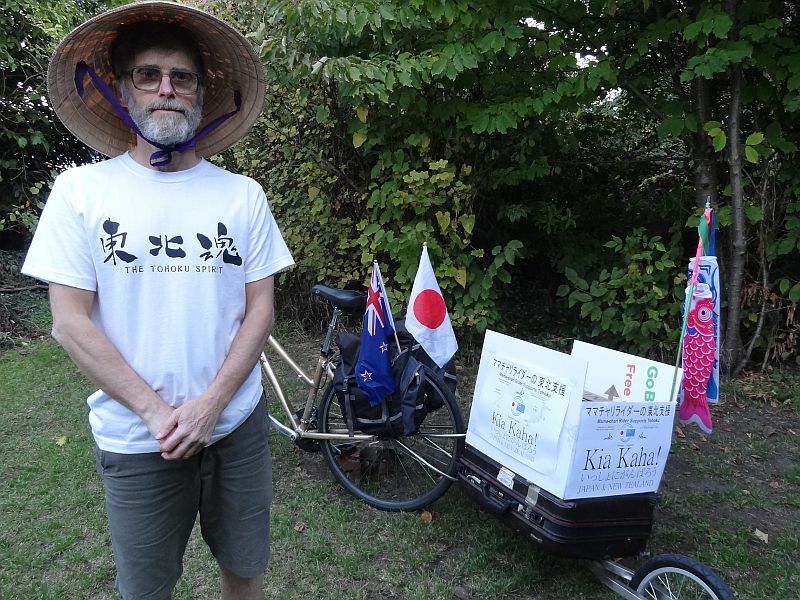 Now a KIWI friend of mine, Jup Brown is now runnning across Japan at the moment!